Fly Deal Fare Blog: Travel With Ease Air India Reviews, Baggage Allowances, And Services! Air India Reviews, Baggage Allowances, And Services! Air India is the flag carrier of India which is owned by Air India Limited. The airline supports a fleet of Airbus and Boeing aircraft which include 90 domestic as well as international routes. Air India has its hub at Indira Gandhi International Airport (New Delhi). Talking about the competition, the airline is the largest international carrier out of India with an 18.6% market share. Along with that, it holds the third place among domestic airlines in terms of passengers carried after IndiGo & Jet Airways. Initially, the airline was founded by J. R. D. Tata as Tata Airlines but after World War II, it became a public limited company and was renamed as Air India. In the year 1960, it took delivery of its first Boeing 707 named Gauri Shankar and became the first Asian airline to induct a jet aircraft in its fleet. 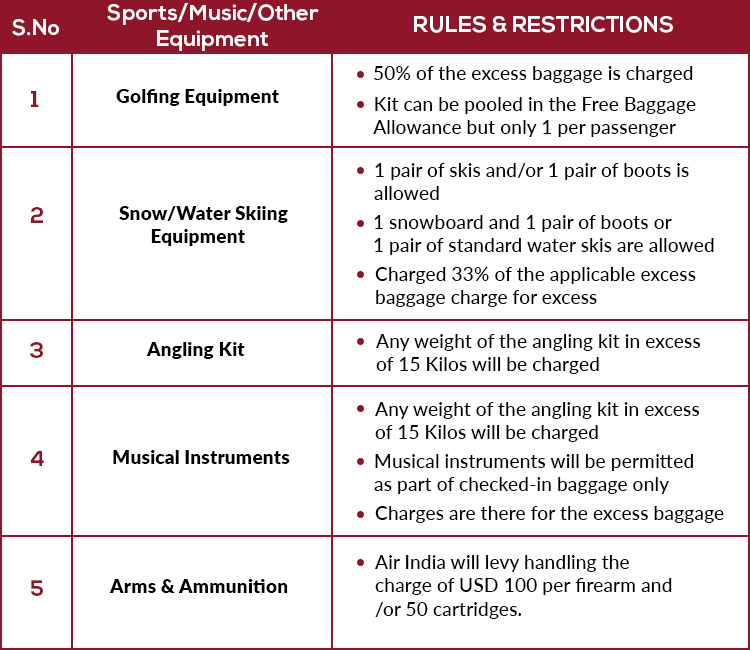 Hand Baggage Allowance: Allowed on both domestic and International sectors on all AI / Alliance Air flights. Passengers who are traveling on Air India domestic sector or to International sector on the same ticket, the Free Checked Baggage Allowance of International sector will be applicable in such a case. Passengers who are the ‘Gold Member’ of Star Alliance can enjoy an additional 20 Kg of baggage allowance in Economy Class. Passengers who are Members of Premium Club can also enjoy additional baggage. If you are traveling with infants, then you are allowed to carry 1 collapsible stroller. Maximum weight Limit for a single piece of baggage is 32 kg in all flights of Air India. Passengers with a wheelchair: Can store wheelchair in the aircraft and can enjoy additional baggage allowances. In case, your baggage exceeds the limitations of the Free Baggage allowance, then you need to pay the excess baggage charge for the extra luggage. For Domestic sectors within India: The excess baggage rate is INR 400 plus the GST per kg. In case you receive your baggage late or do not receive, then you need to contact the Air India personnel present within the arrival hall. You need to file a report (mainly a Property Irregularity Report will be filed). On international travel, if you receive your baggage late or your entire luggage is delayed beyond 24 hours especially when a passenger is on a visit to a foreign country, then the one-time interim expense of GBP 50.00 or equivalent in local currency is reimbursed. In India, the amount is INR 3,000. In case, the delayed baggage could not be traced within 21 days from the date of Property Irregularity Report, then it is concluded as AIR INDIA LOST BAGGAGE. The passenger of the respective baggage can claim for the same as per laid down procedures. In case, your baggage is damaged or comes in pilfered condition, then you need to contact Air India personnel and need to report for the same. After that, your baggage will be physically examined by the personnel. He/she will check the affected baggage and assess the nature, extent, and repairability of the damage. You can claim in case your luggage show any evidence of wear and tear like the minor cuts, scratches, dents, etc. This will not include stuff like broken wheels or handles, damage due to over packing of bags, damage to items of a fragile or perishable nature, etc. Flights of Air India aircraft support Thales i3000 in-flight entertainment system. There is also the availability of five channels airing Hindi and English content. If you want an ultimate entertainment on an Air India flight, then Showtime is the official entertainment guide of the airline. Air India also published a bilingual in-flight magazine, named ‘Shubh Yatra’ in both English and Hindi language for the passengers. 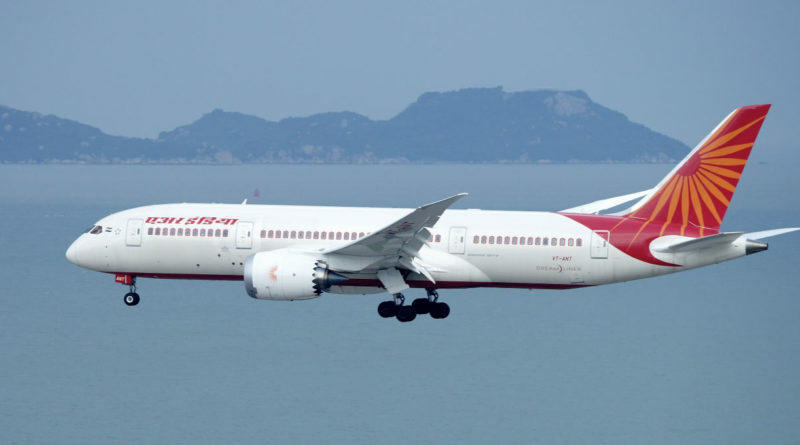 Air India has a frequent-flyer programme called ‘Flying Returns’. The programme is shared by Air India and its subsidiaries. Passengers can easily redeemed points for awards travel on some other airlines too. The Maharaja Lounge: First and Business class passengers can enjoy the luxurious facilities of this lounge. Air India also shares lounges with other international airlines at international airports. The airline holds 8 Maharaja Lounges in total. Air India also provides you the facility to do check-in online through the AIR INDIA website. You can easily make a selection of your seat online and also print boarding pass. In case, you need any assistance for your baggage to deposit, you need to report for the same in advance before check-in closure at airports. The airline has also provided its passengers the ability to book tickets through mobile for the comfort and ease. They have provided a website that opens in a new window from your mobile handset. Through this, you not only check-in for your flight, but also can choose the seat of your choice. This will also make you get full details of the time table and you can easily connect with the airline executives in case of any emergency. Through this, you can easily check-in on all Air India flights, both domestic and International. I flew from London to Newark. It was a very nice surprise as there is much more room on Air India Boeing 787 as compared to BA. There is more space between the seats and the width of the seat was wider. The food is okay, and booze plentiful. There are no Noise Reducing headphones which I expect in Business Class. And they do not have their own Airport lounge, anyhow at Heathrow share the Lufthansa lounge which is nice. In Newark, they share the Virgin lounge and the Virgin staff treated us very badly. We do not get food and there is no waitress service for a drink also. I had traveled on the early morning flight from Mumbai to London on the Air India flight. I was pleasantly happy with the experience on the flight. The flight departed on time and after takeoff, we get the breakfast. As I had opted for the vegetarian option, I choose a veg cutlet, stuffed parathas with fruits and tea. The breakfast was very tasty and the in-flight entertainment was also good for this 9-hour journey. It had sufficient programs to keep one occupied. I also get a few hours of sleep in the economy class. The seats are comfortable enough and there is enough space. I possibly get the best leg room for an intercontinental flight in economy class. The crew was very polite. Once again, I opted for the veg course which consisted of mixed vegetables with rice and rajma (beans). Then, I get my favorite thing i.e. the dessert along with a cup of tea. I must say that the quality and quantity of food served was excellent and delicious aboard this flight. We arrived perfectly on time thankfully. And I liked that instead of plastic forks and knives, steel cutlery was used. I will definitely fly again with Air India and also recommend this to every passenger out there. I went from Mumbai to London. I would say it was a wonderful experience on the flight. I opted for the vegetarian option for breakfast so I pick a veg-cutlet, stuffed parathas, and bhaji along with a croissant, fruits, and tea. I enjoyed the in-flight entertainment and I managed to get a few hours of sleep too. Talking about the seats, they are comfortable enough. The crew was very polite and provided regular drinks on time. Before landing, the lunch was served to us. The quality and quantity of food on the flight was also excellent. And I liked that instead of plastic forks and knives, steel cutlery was used. I would fly again with Air India for sure. ← Things To Do When Your Flight Gets Canceled!